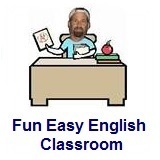 ﻿ Fun Easy English - new classroom free online classes english language lessons speaking listening writing reading november 14. Today in the classroom you are going to learn American English standard acronyms beginning with the letter L.
American English standard acronyms. 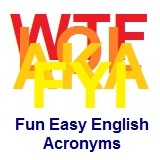 Use the Fun Easy English dictionary for a more detailed explanation of the meaning of each acronym. Internet slang (Internet shorthand, Cyber-slang, netspeak, chatspeak, or translexical phonological abbreviation) refers to a variety of slang languages used by different communities on the Internet. Many people use the same abbreviations in texting and instant messaging, and social networking websites like Facebook. Hey do you know any English acronyms used in texting, instant messaging, and social networking websites not listed on this page?